by Jason Richards, reprinted with permission from New Wave Games Inc.
What a weekend! The excitement has gone but the feeling of awe has settled deep in my being. I still have a hard time believing I won six demons at this years US Games day. I have always believed that if I went to Games day I would enter as many categories as possible so I would have a better chance of taking home at least one trophy. This shotgun approach, while reasonable on paper is very difficult to make a reality. Time is the most important commodity we have and I just spent 5 months of my life for this endeavor. In those 5 months I did over 1000 hours on nine entries [I only took 8]. If you do the math this is an average of 50 hours a week for 20 weeks. I also work full time so most evenings were filled with painting and weekends went by in the blur of a brush. I walked the fine line of a controlled burn out for the majority of the last month and as it is, now I am interested in converting again but painting seems difficult to imagine. We shall see. As some of you know I also paint professionally on the side and I must say that the endurance required to do armies pales in comparison to that required to do uber models. Was it worth it…? I feel that it was. In one weekend I have joined the elite rank of golden demon winners and even the elite of the elite as a multiple gold winner. I knew I was a good painter and have been told by many others that I am a good painter. Now I have been judged by those I respect and I came out with more than I would have allowed myself to imagine. I have been told by another very respectable Golden Demon winner that winning demons doesn’t matter…I disagreed then and I still disagree. I feel that the validation of style and talent to yourself as well as others is quite important. This is the big show where our art is judged and our soul is laid bare [a bit metaphysical but true]. Judging art is extremely difficult and being judged is also extremely stressful. 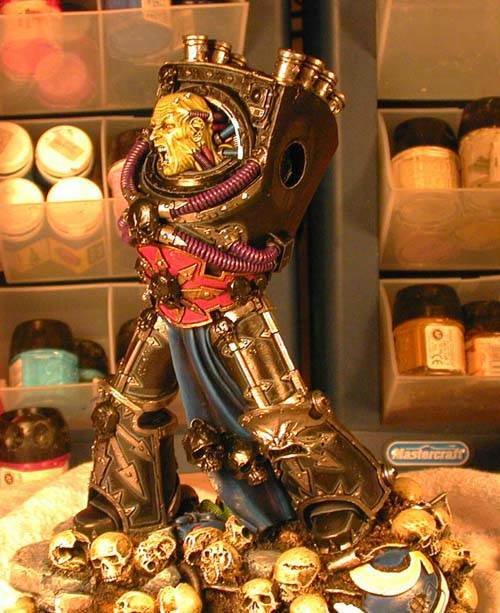 I decided long before I knew I would win any trophies to record how I painted my entries since they would be the best models I had ever done. I did this in 2 ways: I have a photo record of 189 pictures taken throughout the entire process and I noted how I did what while painting the figures. This record keeping, while disruptive to my normal creative process, actually helped me in the end. I was able to see what I did at a certain stage and to see how I went from point A to B. The breaks for photos and note taking also allowed me more time to formulate my next step. 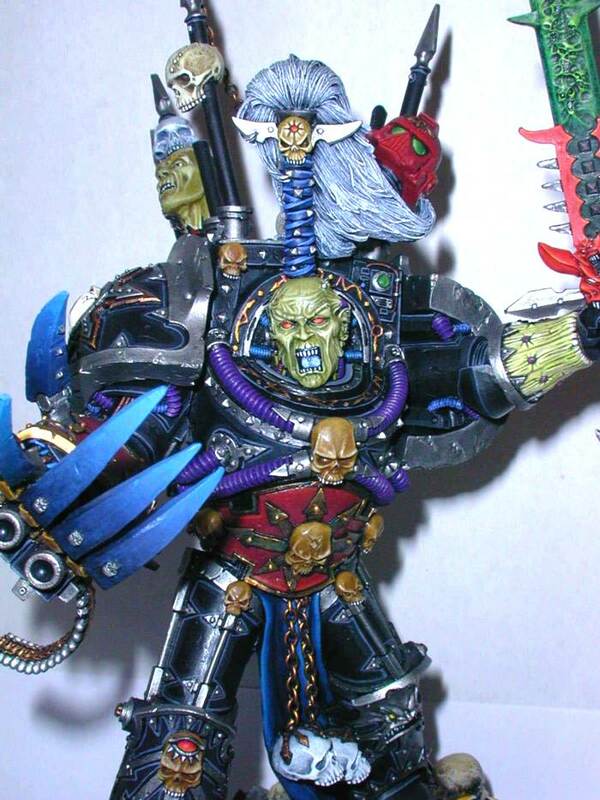 The model with the most impact has to be the Forge World Abaddon. He was too big to put in a box so I carried him to registration. He was like a magnet pulling other painters to observe and comment. While I was quite flattered I was also quite nervous about all the attention since the resin is quite brittle and it takes almost no contact to cause something to break. 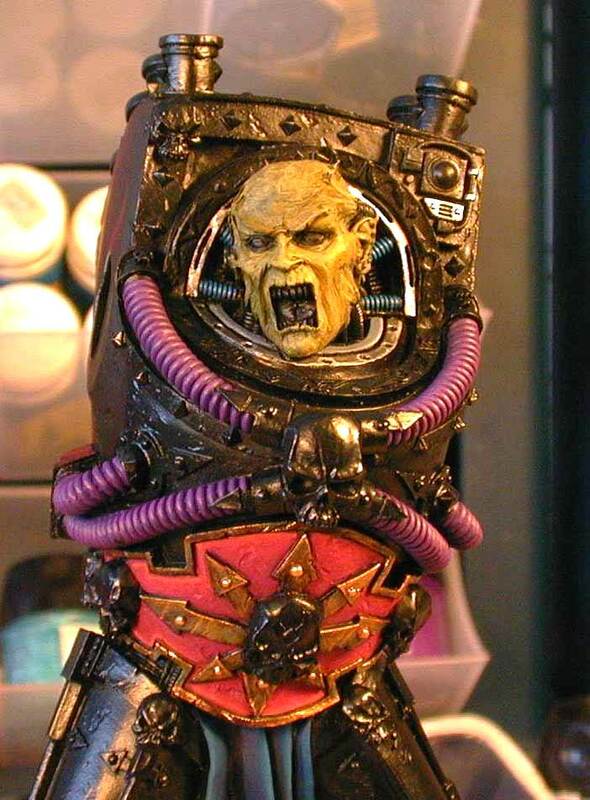 I would like to relate the experience of painting this awesome model in a how-to article. It will show how I do what I do and what goes through my mind as I do it. Remember that it took me 160 hours to paint this model and while some of the techniques are arduous they all aided in Abaddon placing 2nd in Large Model at this years USGD. I started Abaddon a few months before I purchased him. 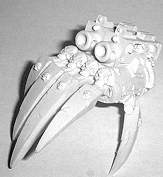 That is, I fell in love with the model and formulated a plan of attack the moment I saw him on the Forge World site. I decided that since he is chaos undivided I wanted to impart that in how I painted him. So while all the colors work well on the model and are for the most part separated by vast expanses of black armour I used a very broad paint palette. 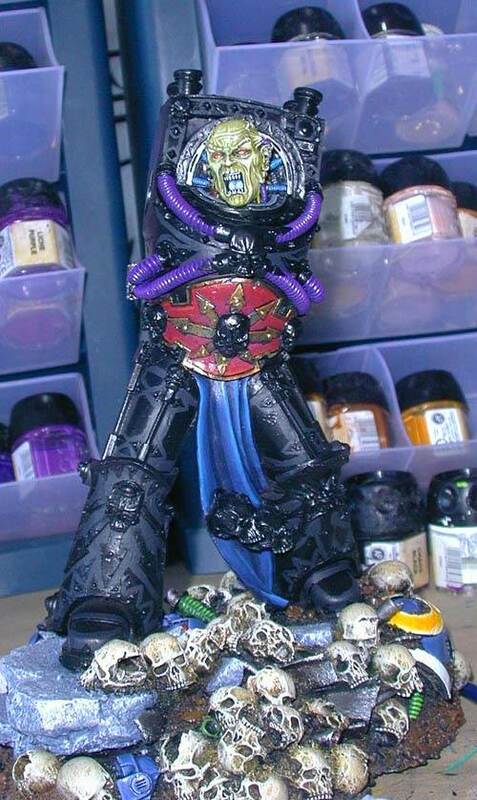 I also wanted him to have silver trim on his armour since that is how the Black Legion’s armour looks. The gold trim, while nice doesn’t tie in with his chapter enough for my taste so that was the first major conceptual difference between the way GW paints him and how I saw him looking. I purchased Abaddon at a retail GW store while on business. When I got him home I washed all the pieces in warm soapy water, rinsed them and left them to dry. I did this to make sure that the large areas were free from finger oils and dust so the primer would adhere better. I rarely do this on a standard sized model but Abaddon is so big that any and all primer trouble would be very apparent. It is at this point that I realize his sword is not true. It is bent towards the top of his wrist by about 15 degrees. 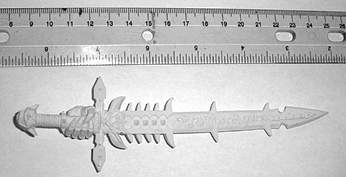 With such a long blade this was very noticeable at the end of the blade. I e-mailed Forge World and had a solution in a day from Ewen Little. If placed in very hot water for 10-15 minutes the resin will become soft and can then be manipulated back to it’s normal position. After I heated it and straightened it I ran it under cold water to fix the shape. It took three tries before I was satisfied and even then it has a little bit of a bend. So once the statue and assorted pieces were dry I primed them black with GW primer. This took quite a while as there are many different surfaces and angles to hit. Once I was finished priming I brush painted all the cracks and crevices I couldn’t reach with the spray in black. 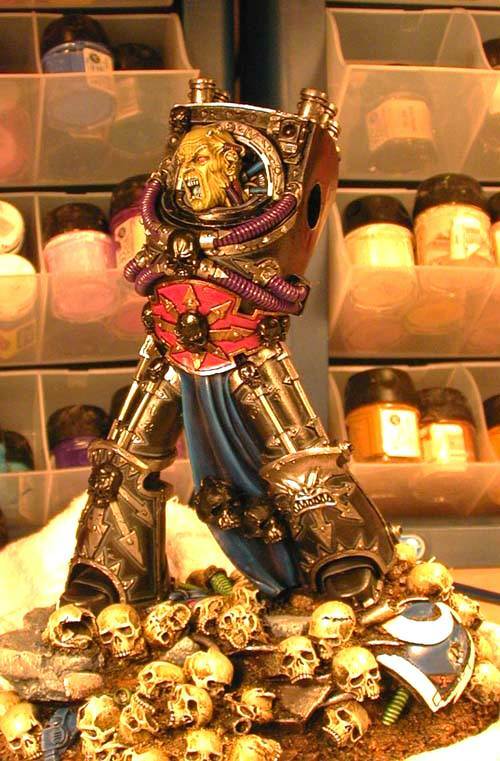 This was especially necessary around the cables of his head and the skulls on the base. Once I had all the pieces black I coated them with a thin layer of matte varnish. This was because I would need to hold the model way more than normal and with the weight of the statue I foresaw wearing paint down with contact. You will have noticed that I refer to pieces of the statue. Well, I saw the need to paint him in pieces from the get go. 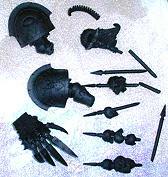 This is pretty standard when I am painting a multi pieced model but for Abaddon it was especially important. This is because of the need to get at all the pieces and the odd angles I would have had to paint at had I assembled him. Also by keeping him in pieces I was only handling the piece I was painting, thus limiting the contact with the rest of the model. I will now begin the true painting discussion. In this discussion I will type the colour I used once [all the colours were GW paints] and behind that I will include an abbreviation. The abbreviation will commonly be the first letter of the two words that the paint is named. So for example, Blached Bone will be [BB], Blood Red will be [BR], and so on. Where two paints have the same initials I will add the second letter from the first word between the initials. So, since Bleached Bone is [BB] then Bubonic Brown will be [BuB]. This will save me a tremendous amount of time especially when I get into the complex colour mixing I did. So once I had him primed and coated with sealant I applied a covering layer of Chaos Black [CB]. Once all the slight gloss effect from the spray was covered I knew I was finished covering the model and sprayed it again with a dusting of matte varnish. After this I decided to tackle the base first. The skulls of the base are absolutely amazing in their anatomical detail and sheer number. Due to the extreme reality of the skulls I decided to paint them in a truly real manner. To do this justice I went to the public library and checked out books on forensic science, anthropology, modern warfare, etc. Human bones have quite the range of colours depending on time of death and climate of decay. I decided that the skulls of the base would be relatively new and possibly exhumed so they would have no bleaching evident. So I started by painting the skulls Scorched Brown [SB]. I wasn’t too concerned if a bit of black ghosted through since I had a long way to go to build up the true end colour. I then painted them in Bestial Brown [BeB] covering all the surfaces but trying to stay away from the deep recesses of the eye sockets and the inside of the cranium. This was done so latter I could have a more realistic contrast of light and dark. Now the next few steps lay the basis for the surface colour of the skulls. I then wet brushed with a 50/50 mix of Vermin Brown [VB] and BeB. When I wet brush I handle the brush the same as for dry brushing except I have more paint on the brush. This reduces the chalky look dry brushing can give. It is almost impossible to see the effect of this stage since the colour is so similar to the base coat and the technique used doesn’t lay down much paint. It is however very important to build up to a final colour gradually. After the first wet brush I did a series of wetbrushes with 70/30 VB/BeB, 90/10 VB/BeB and 100% VB. This really started to bring out the detail and the textures that were evident on the base. I decided after looking at my resource books that the base was a bit too dark so I decided on another work-up using Snakebite Leather [SL]. The great thing about SL is that it is sort of an opaque colour and allows for great effect work with a minimal amount of time. So I did a straight SL wet-dry brush [not quite a dry brush since I had a bit more paint in the brush during this step] to all parts of the skulls. I repeated this three times to get the smooth effect of a good base. Once this step was finished I was happy with the base work-up and decided to add some of the more realistic tones. I still had a long way to go for the final look but it was at this step I added some non-standard colours to the skulls. I had observed in the books that even unbleached, exhumed skulls have a tint of grey in them so it is here I added that. I knew that the next work-up would all but cover the grey but you would be surprise how keen the human eye is at picking up these buried colours. 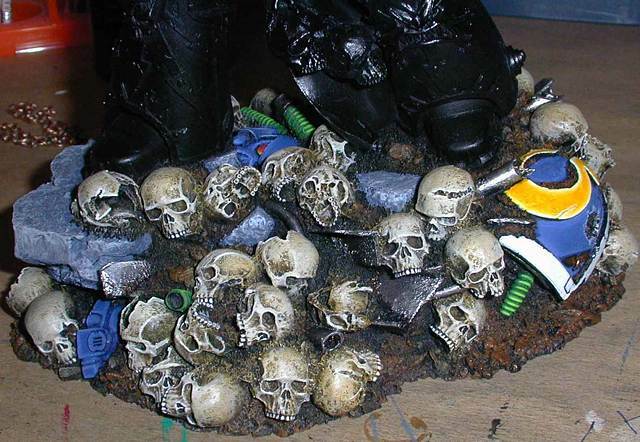 So I diluted Codex Grey [CG] until it was very thin [almost like 2% milk] and then applied it willy-nilly to the skulls. I didn’t need to be careful since it is going to be a tonal effect rather than an observed colour. I did this a few times [accelerating drying with a blow dryer] until I was just able to discern the colour in the recesses of the model. Another tonal effect I added at this stage was blue. I observed, in almost all pictures of exhumed skeletons, a slight tint of blue on top of the darkest brown. Now, I still don’t know if this is an artifact of the photography or not but I decided to add it anyway. So with a very dilute Enchanted Blue (old hex bottle) [EB] I applied this colour into the eye sockets, cranial cavities, and mouths. 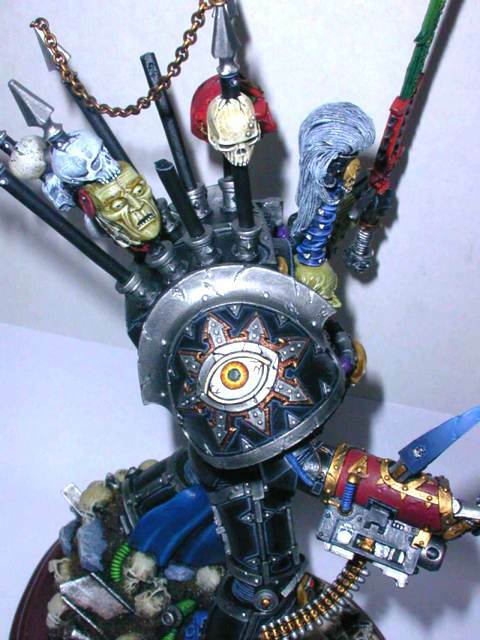 I was careful not to get it anywhere else since it would have seemed out of place on the exposed parts of the skulls. I did this twice until I thought I could see the colour. It was important not to add too much incase it was an artifact. Now that the mid level tones were finished and the base work-up was complete I moved on to the final stages of the skull painting. I dry brushed the skulls with Leprous Brown [LB] which is another of the opaque paints made by GW. This is now the ‘clincher’ colour in all my skull work-ups after I did Abaddon. It is amazing how the yellowish brown of the colour adds depth and realism to the skulls. I did two to three dry brush applications depending on the area I was hitting. For the large areas, like the cranium and sharp areas like the cheek bone I did three applications. Once I was done with the straight LB dry brush I started a series of dry brushes with Bleached Bubonic Brown [BBB] (20% Bleached Bone/80% Bubonic Brown]. So in order I did: 70/30 LB/BBB, 50/50 LB/BBB and 30/70 LB/BBB. It was at this point I added some Fortress Grey [FG] to the mix, maybe 5%, to increase the grey tone on the bone ridges and cranium. The above series was done over the entire area of the skull with little emphasis on any particular area. I now decided that the base colour was getting pretty close to true and so I started to emphasize the ridges, cracks, and major textures. I did this by continuing to dry brush the entire skull but always lingered on the above areas. During the final colour work-up I reduced the amount of paint going to the large areas and focused much more on the ridges. I did the final work-up with BBB and Bleached Bone [BB]. So in order of application I did 80/20 BBB/BB, 60/40 BBB/BB and 30/70 BBB/BB. It is here that I was seeing almost exactly what was in the books I was using as reference. At this point I had a very real look but lacked the sharp definition on the ridges and cracks. I diluted 100% BB to about the consistency of 2% milk and proceeded to paint around the cracks and ridges. I must have done this 3-4 times before I had a recognized lightness to those areas. I then repeated the highlighting focusing on crack ends and extreme bone ridges with very dilute Skull White [SW]. Because it was so dilute I was able to jump so far in the progression of the colour. I then used a much less dilute SW for the teeth and I was finished the skulls. Now that the skulls were finished I decided to finish the rest of the base. This includes the granite slabs, rocky dirt, Ultramarine parts and cables. I decided to tackle the ground dirt first as it was going to be the easiest part of this next stage. When I had based the skulls in Scorched Brown I had also covered the dirt in the same colour. 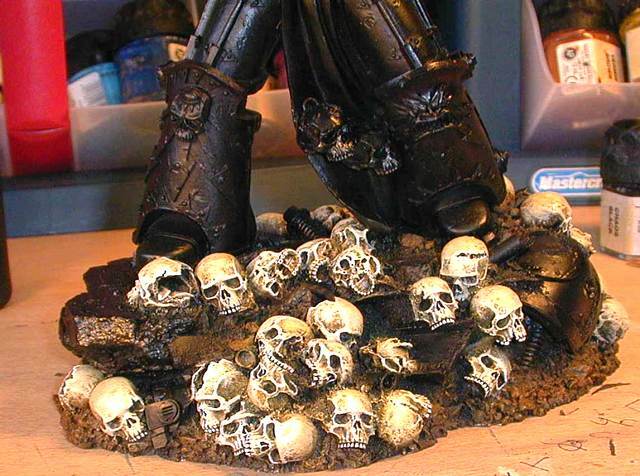 I had decided early on that for a good contrast between the skulls and the ground I would need to keep the ground dark. This would 'isolate' the skull groups and individual skulls giving them a sense of 'loneliness'. This is one of those artistic choices that on the surface looks like a simple fact of defining the focus but the deeper 'loneliness' is actually more important to the piece as a whole. Due to the presence of finished skulls littering the base I was forced to do each piece of earth by brush application instead of dry brush. During the skull work-up I had hit parts of the earth with lighter colours so my first step was to repaint the earth in Scorched Brown. Once this was finished I applied BeB to each piece of earth so as to completely cover the darker colour. Note that, this was done to the pieces of earth and not to the layer under each piece, I left that dark. After each piece was done I applied another layer of BeB at the edge closest to the surface. I then highlighted this with VB and lastly [90/10] VB/BuB. This kept the earth dark but allowed me to add depth to the amazing texture present on base. Once this was finished I did the granite slabs present under the models right foot and behind the left foot. Since I decided it was to be granite, or building concrete, I base coated these areas in a darkened Shadow Grey [SG]. The base was [80/20] SG/CB. I used the last bit of dry brushing for the entire statue at this stage. I feel that dry brushing has a place even in display and competition pieces. It is an underutilized technique in high end painting because of the feeling that it is a lesser form of painting. In my opinion, if used sparingly, it can yield remarkably lifelike textures and effects. So after the base I did a controlled dry brush with 100% SG. By controlled I mean that I was especially mindful of the finished skulls and dirt on the base. I then did a series of dry brushes with more and more emphasis at the edges and deep texture areas. This form of dry brush highlighting works especially well on rocks. The work-up consisted of 70/30 SG/Codex Grey [CG], 40/60 SG/CG, 10/90 SG/CG, 100% CG, 80/20 CG/Fortress Grey [FG], 50/50 CG/FG, 20/80 CG/FG, 100% FG. As you can see from the number of blends I can make quite seamless natural looking highlights on any kind of stone work. The trick is to gradually move towards the edges with every blend so that the last blend is tightly concentrated at the hard edge. After the dry brushing I then apply a thinned down SW to the edges and the larger textured areas. This is done with a fine detail brush in many transparent coats so I can vary the intensity of the white depending on the area I am highlighting. Once I had the white finished I was done with the granite and then tackled the Ultramarine parts of the base. I decided to do the blue of the Ultramarine armour before the yellow of the omega and the white of the should rim. The reason for this is I wanted to reduce the amount of contact I would have with these colours as they are easily stained. So I started by base coating all the armour plates and helmet bits in a darkened Ultramarine Blue [UB]. I usually work from the darkest colour of a blended area to the lightest by continually lightening the initial colour until I have reached the final highlight. As a result I usually start at a shade that is approx. 3-4 shades removed from the actual colour I want. The darkened UB was a pre-made blend of 5/45/50 Imperial Purple [IP]/Regal Blue [RB]/UB. The purple is barely visible in the blend and is there to enhance the depth of the darkest part of the armour plates. Since this is the first time I will be doing any smooth brush blending I will describe what I do when I blend so I wont have to go into the details every time. All the paints when I blend, after the base coat, are ultra-thin [consistency of skim milk] to make the seamless effect possible. After a base coat I will apply a slightly lighter shade of the base colour to almost the entire area of area to be blended. The areas I do not apply the lighter shade to are the cracks [if any] and the very center of the area to be blended [if a plate] or the area furthest from the envisioned lightest area [for linear blended areas]. The thinned paint dries as soon as the brush leaves the contact point on the model. This means that for a long brush stroke the paint is drying at the beginning of the stroke while it is still wet where the brush is. If the paint doesn't display this property then it is likely too thick. I then repeat the application of this shade a fraction from the edge of the first and so on. When I start to be unable to notice even a slight difference in the blend I will add a bit more of the lighter paint to the thinned down paint I am blending with. I then start applying this lighter shade to the area that I stopped applying to with the previous mixture. It is at these junctions of shade that a slight difference can be observed under strong light. So once an area is about 80-90% blended to the top highlight I go back and blend the blend even further with a water colour like technique. I choose a colour somewhere in the middle of the blend and dilute it even further than what I blend with. It is very thin at this point so that a stroke with it on the blend has absolutely no visible effect. I apply this 'water paint' to the surface of the entire blend [darkest areas and lightest areas included] and force an even drying with a blow dryer. The trick of this technique is that it must be done many times for any effect to be observed. After a variable number of applications, depending on how smooth the original blend is, the area will be a smooth seamless blend. I then finish the lightest part of the blend since I don't want the highest highlight to be dulled by the 'water paint'. The lighter the blend the more difficult it is to see shade differences so that is why I can get away without 'water painting' this part. This technique works very well on larger models but it must be modified to be used on smaller figures. It is a very time consuming method of blending but the results are consistent and the blends are so smooth that many people have asked if I airbrush parts of my models. So now that my method of blending is down I will explain what colours I used and why I highlighted up to the point I did. As I said earlier I based the armour in a darkened UB so that I would have a satisfactory contrast between the armour joints, rims and broad plate areas. Some amazing painters actually start at the middle shade in a blend and then highlight in one direction and shade in another. While I did this for the Space Wolf dreadnought I entered at USGD it is not really my preferred method of doing a blend. I find that starting at the darkest shade and working up is just easier for my style and temperament. The colour blends I used to achieve the blend on the armour is as follows: 30/70 RB/UB, 10/90 RB/UB, 90/5/5 UB/Hideous Blue [HB]/BB, 70/25/5 UB/HB/BB, 50/45/5 UB/HB/BB, 20/75/5 UB/HB/BB, 90/10 HB/BB, 85/10/5 HB/BB/SW. Ok, so at this point I have joined the rank of the truly mad painters. One thing to realize is that each of the above blends as applied approximately 6 times in sequential layers until a new blend is required so that translates into around 48 layers on the armour. And some of the layers are actually done more than once for emphasis. Like I said blending with this method is very time consuming! So when I was at the 90/10 step I did the 'water painting' with the 50/45/5 blend. This helped to give the huge plates a smoother transition from shade to shade. The reason I chose to do the blend with Hideous Blue is because it complimets the UB very well. It has a bit of sheen that sets off the colour better than other blues that I have in my collection. 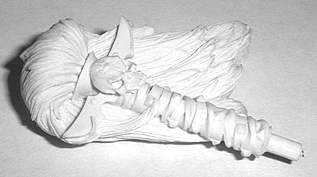 The Bleached Bone was added early on in the blend and carried through the entire process as a way to lighten the highlight in a softer way than Skull White would have done. Usually I would have highlighted a figure up even further so that there was a kind of 'glow' to the armour. However, for this figure I decided for a more subdued look as the armour is nothing more than rubble and the lighting effects should reflect this. Also, the shoulder has a broad band of white and this is effective as a super-highlight without actually being a highlight. Even at this scale it is important to create illusions of lighting so that your eye moves over the model in a smooth flowing fashion. So after the blue I did the yellow of the omega on the shoulder. I based it in BuB until all the black was covered and none ghosted through. By ghosting I mean that when looking at the area under strong light I was unable to see any black at all, as this would cause problems with the yellow blend above. I then applied Golden Yellow [GY] to the area covered in BuB. While this colour is much different from the final colour I wanted it was a good yellow base to work on. I then did the following blend, leaving very little of the original GY showing through, Sunburst Yellow [SY], 80/20 SY/SW, 70/30 SY/SW, and so on in 10% increases of SW until I was at pure SW at the outer edge of the omega. With the omega finished I decided to finish the shoulder rim. This was likely not the best decision looking back but I was anxious to finish the shoulder. The reason why it wasn't such a good idea is that the white of the shoulder rim is actually what I call a 'pivot point' and so I had to be alter how I hold a model after I did the white. A pivot point is a section of a figure that allows me to rotate my grip on for the best angles of painting. It is actually extremely important to study a figure, especially a large model, and identify where you will hold the figure and plan your painting based on this. The white rim is extremely simple, being only 5-6 coats of white until no black ghosted through and then rim highlighting in Space Wolf Grey [SG]. At this point I was forced to decide if I wanted to 'dirty' the white and yellow or leave them unnaturally clean. I decided that the final look would be better served by a clean look so even though I wanted a high degree of realism I had to accept this. Why? 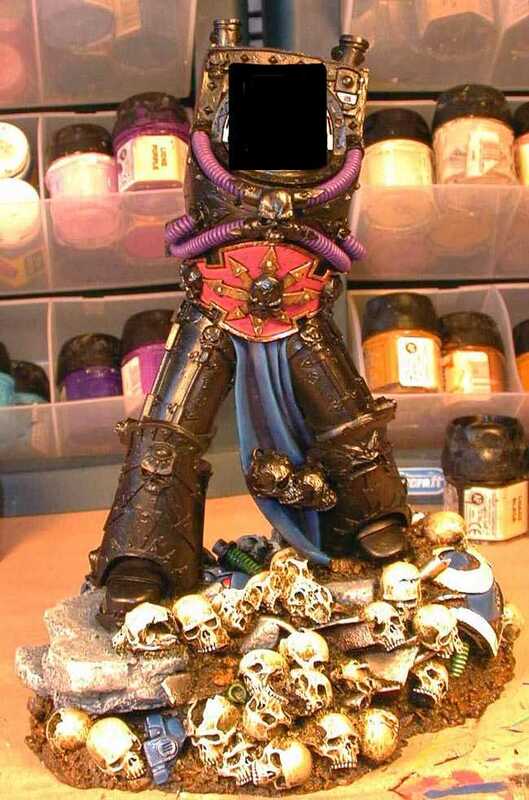 Well, it is basically an issue of a final vision of a dark and brooding figure and a need to provide a focal point on the base so it wasn't a blur of skulls. At this point I was feeling very good about the base and knew this was going to turn into on of my best figures to date. I decided to take a break from the blending and painted the metallic I beams and damaged armour bits. I based all the metal areas in Tin Bitz [TB] and then they were done simply with a darkened Boltgun Metal [BM] that is 70/30 BM/CB. This layer was done so that some of the TB ghosted through. Then I did 3 layers of metallics as highlights starting at 100% BM, 70/30 BM/ Chain Mail [CM], 50/50 BM/CM. My intent here was to provide a very muted metallic that reflected the damaged quality of the metal. So that I could have all the little stuff out of the way when I did the eyes [2 at the back of the base and one between his legs] I decided to do the power cables. I decided to add an artificial 'organic' element to the bases by doing the cables in green. They were based in a few coats of Snot Green [SG] and then the ridges of the cables were done in Goblin Green [GG]. I then did a focused highlight to the middle of each ridge using: 50/50 GG/ Scorpion Green [ScG], 100% ScG, 50/50 ScG/ Bilious Green [BG]. I knew these cables were destined to fade into the skulls of the base but they do provide a twisted sense of 'life' that was appealing to me. Lastly I did the eyes of the base. Reflective eyes and gems are done in pretty much the same way in that I start with a medium dark shade and work to the highlights and then go back and work up the shadow. I find that on small areas this is a better way to do blends than what I described above for broad areas. So I based the eyes in Scab Red [SR] and then did the following highlight blend in a crescent shape at the lower edge of the eye. 100% Red Gore [RG], 80/20 RG/ Blood Red [BR], 70/30 RG/BR, 50/50 RG/BR, 30/70 RG/BR, 100% BR, 50/50 BR/ Blazing Orange [BO], 100% BO, 100% GY, 100% SY. Notice that as I come to the end of the highlight I start to add the colours in much sharper layers. This is done to create an iridium effect at the highlight and is complimented by a few layers of gloss varnish. So the base is finished and to keep myself from wearing it down I sprayed it with a dusting of GW matte varnish before I did the gloss of the eyes. I also taped a layer of the big bubble wrap around the base to that I would protect it that much more from wear during painting. The next stage of this project was the centerline of items: loincloth, girdle and power cables. I chose to do these as they are recessed and where they are not recessed there is a skull protruding that I would paint later. This decision was made with the 'pivot points' of the model the only factor. I had seen how much handling I had to do for the base and just how much primer I wore off due to continuous contact and knew this had to be foremost on my mind from now on. It actually worked out well since I was able to hit on the various colours associated with each chaos power due to the unfinished black of the body. This lack of competing colours, contrasts and tones allowed me a sense of painting totally independent models. While this could have been disastrous once I connected all the 'independent areas' with the silvers and black highlights I just had to trust to my final vision. Had I done these areas last I might not have been so adventurous with my selection of colours. I needed four different colours for the four different chaos powers and so I chose to use: blue for the loincloth, red and metallic bronze for the belt, purple for the power cables and green for the flesh of the face. In my mind the colours symbolize, in order, Tzeench, Khorne, Slaanesh and Nurgle. While I will not be discussing the face in this part [it is a part all by itself] just keep in mind that that is way it is a sickly green. I started with the loincloth, likely because it is the most sheltered of all the parts I now set out to do. It is also blue and that is one of my favorite colours to work with. So I started with a base of 70/25/5 Regal Blue [RB]/Imperial Purple [IP]/Chaos Black [CB] so that it would be dark and deep at the same time. As I mentioned earlier I start at the darkest shade and then work up from there as I blend so this was a plenty good base to build from. With the base applied 3 times for a single solid shade I started to highlight the raised folds of the cloth. For this kind of highlighted blending I follow the same method of blending described in Part II. I apply the next shade to the raised fold of the cloth about half way into the recessed part of the fold. This will allow me to blend up the highlight from the darkest colour in the groove to the lightest colour with a really sharp contrast. While some degree of contrast is desired when doing cloth folding, light does strike into cloth recesses naturally hence the reason for my blending start point. I wanted to have a sharp transition from the shadow shade to the start of the highlight shades based on the effect I desired. I wanted the sharp contrast because it would make the cloth look more dramatic even if it was a bit unnatural. This is one of those 'illusions' of reality that painters use to create effects that are pleasing to the eye. So my first blending shade was 70/30 RB/ Ultramarine Blue [UB], This was repeated 4 times up to the boundary of the shade to give the sharp contrast I wanted. Then I progressed the blend to the top of each fold with the following blend: 30/70 RB/UB, 100% UB, 50/50 UB/ Hideous Blue [HB], 100% HB, 50/45/5 HB/ Skull White [SW], Rotting Flesh [RF] and finally SW at the very top of the ridges in a thin highlight line. These were done more abrupt than most blends to further emphasize the dramatic nature of the cloth I was trying for. I moved on to the girdle next. Red is one of those colours that either works or doesn't work for me, depending on the desired effect. So I was pretty nervous when I started the belt. I put down five layers of Scab Red [SR] to get a solid shade of the colur with no black ghosting through. I then immediately started the highlights towards the outer rim of the belt. I did this in all directions as if the light was emanating from the girdle itself. I did the following blending work-up: 70/30 SR/ Red Gore [RG], 50/50 SR/RG, 30/70 SR/RG, 10/84/5/1 SR/RG/Blood Red [BR]/ Jade Green [JG]. I will stop the blend series to relate why there is that touch of JG in the blend. The way I do my metallic bronze/copper is the method described in White Dwarf a few years ago. It is a great method for getting the aged look of the metal and it uses Jade Green to impart the oxidized layer on the metal. I knew I was going to use this method on the chaos star and rim so I wanted a subtle tie-in to the red. This small addition of JG to the reds is just enough that the eye will not see it but it will tie into the rim better when it is completed. I carried this small addition of green through the next series of shades, and it was also present in the water paint blending stage. So I continued the work-up with 80/19/1 RG/BR/JG and then ended the blend with 70/29/1 RG/BR/JG. At this point I felt I needed a sharp contrast between the red of the belt and the soon to be metallic of the rim so I added a line highlight of 40/60 RG/BR. 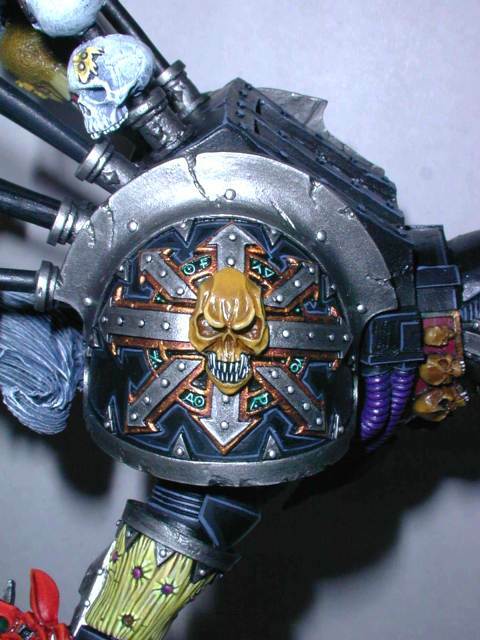 With the highlighting finished I went back and shaded the red around the inner parts of the chaos star. I did a small work-up to further deepen the red and provide the desired sense of internal power. The blend is: 90/10 SR/ Scorched Brown [SB], 80/20 SR/SB and 70/30 SR/SB. Once I was finished the shadow shades I applied a water paint of 5/80/14/1 SR/RG/BR/JG to the surface of the entire area of red. I did this a couple of times and then focused about six applications at the outer edge to blend in the line highlight a bit. When I started the reds I was nervous and while I was working on them I was not at all happy with the effect I was getting. I persevered, in my stubborn way, and in the end I was very happy with the end result. This perseverance is something that I would encourage all painters to develop and encourage. Wait to re-paint something, or soak it until you are finished, especially if it is a long process. Trusting in your sense of colour and skill are so important when painting super high quality figures. The rim of the belt and chaos star were gonna be much easier than most of the items I had worked on so far. It requires no blending, which was a nice break, and is all about controlled dry brushing to achieve the desired effect. So I started with a wet dry brush of Tin Bitz [TB] making sure I covered all the areas of the rim and star. I then wet dry brushed JG to the entire surface of the rim and star. I made sure I didn't hit all the raised areas but I did cover approximately 80% of the TB with no focus as to where the paint was applied. This sets the basis for the old weathered look of the bronze I desired for the rim. After the JG came a dry brush of Beaten Copper [BC] that did little more than tint the JG. Next came a dry brush of Shining Gold [ShG] to the entire surface. This was a weak application intended to soften the underlying JG and darker metallics. I then did a series of dry brush applications of ShG with emphasis at the edges of the rim and star. The belt was now looking very Khornite and I only needed some metallic line highlights to be finished. I applied ShG in line highlights to the outer edge of the rim and star, the cracks and the bolts on the star. I did this a couple of times bringing the highlight towards the angled areas of the belt rim and the ends of the star. At this time I decided to add a few parallel lines to the broader areas of the rim and star. This is a way to display a sense of metallic shine if it is done in an unobtrusive manor. The last bit of highlighting was done with Burnished Gold and was applied to the bolts and extreme points of the star and certain parts of the outer rim. With the lower portion done I moved up to the six power cables that I was going to paint purple. I wanted them to be dark with very minimal highlights in an attempt to let natural light enhance the effect I painted. I normally take purples up very far towards white but decided that if I made the cables light they would become a focal point on the figure and this was not something I wanted. The decision to allow natural light to act as my highlight was a new thing for me and likely only works because the figure is so large. I based the cables in 80/19/1 IP/CB/Cammo Green [CG]. This gave me a super dark base and the small addition of the CG starts the tie in process with the colour I was going to do the face in. These small tie-ins are pleasing to the eye however unnoticeable they are. With that done I did a layer of 94/5/1 IP/CB/CG to each raised area of the cable to make a distinctive separation from the recessed area. I then did a highlight of 90/9/1 IP/ Liche Purple [LP]/ CG on the top facing part of each raised area. This was not quite enough but it sure was close to what I wanted in terms of dark. I ended the cables with two additional highlights of: 80/20 IP/LP and 70/30 IP/LP again focusing on the top portion of the cables. The face is likely the best single part of this awesome statue. From the knotted neck muscles and tendons to the skull studs breaking through the skin to the tongue stud this face is the definition of 'character'. The sculpt of the face itself is just stunning, everything fits together and the feeling of evil is evident. So how to tackle this part of the project? 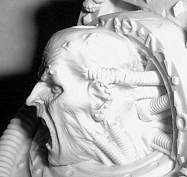 Well, as I mentioned in part III, the head was going to have colouring that I associate with the Nurgle chaos power. So I wanted it to be either a very light green, light grey, or a light green-brown. You will notice that all the colours I decided to choose from are light and this was very much on purpose. The reason Abaddon's head has to be light is it needs to be one of the main focal points that your eye moves to. Since most of the model was to be dark I wanted a head that looked to be leering in a disembodied way. So, the head had to be light and I suspected at the formative steps I would even highlight in white to make it stand out that much more. I have talked about avoiding 'pivot points' on a model until late in the painting process. The head is a good time to talk of another of my painting principles, start from the deepest part of a model and work outwards. This helps to keep things organized and will reduce the touch-ups you have to do later. Now, I will sort of contradict myself by saying that I do the eyes last. The eye is the deepest part of most faces and I refrain from painting it until the face is completely finished. There is really no hard and fast reason for this, it is just one of those things I have done since I started painting. So by looking at the head section I first decided to do the power cables running into his neck deep at the back of the head. I wanted a colour that tied into one of the colours already in use down the centerline and thought the rich blue of the loincloth would be perfect. So I did the exact colour work-up I had done on the loincloth [see part III]. Since I was doing the blues again I decided to try to do all of them at once now. It is quite time consuming to do all those blends multiple times for each piece. So, I also did the blue of the topknot strap in the same way as the loincloth. Why so much blue around the face? Well, it is a dark colour that will help to constrain and frame the lightness of the face. At the same time it is also a rich colour that helps to emphasize the 'character' of the model. Lastly, it is what I call a 'focal point mover' [FPM]. No matter if you start at the base or the head, when observing the model, the blue found in the loincloth will carry you up to the blue of the topknot and cables and vice versa. After the blue was finished I did the area around the head. This area is where the helmet of the armour would seal to the suit and so I couldn't see it being black like the armour. The most inside ring was done in 70/30 Shadow Grey [SG] and Black [CB] and then highlighted in layers with 50/50 Codex Grey [CG]/Fortress Grey [FG], 10/90 CG/FG, 80/20 FG/ White. These highlights were kept tight and focused around the outside arc of the neck piece. Once this was finished I did the metallic silver in the locking area above and below the head. This silver would be tied into the trim of the armour and would act as another FPM. I based the areas in 40/60 CB/ Boltgun Metal [BM] then proceeded to highlight the inner and outer rims and the inside recessed areas with: 20/80 CB/BM, 100% BM and 80/20 BM/ Chain mail [CM]. 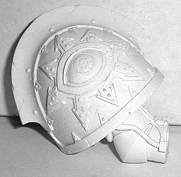 This really brought out the silver and I knew I had found the base work-up for the trim on the armour. After the first highlights I shifted the highlights to the interior detail and the outside rim with a sharp highlight of 100% CM. I also added thin stripes diagonally from the inside to the outside if this metallic ring with the CM. This technique is used to imply the non-highlight shine found on metal. With those areas finished I decided to move onto the face. There were still cables to do but I was undecided as to the colour and felt that the finished face would provide some direction. Well, of the colours I listed above, for the face, I liked the light green-brown the best and so I started the face with a base of Snakebite Leather [SL]. As I think I have mentioned in an earlier part this is one of the transparent paints in the Citadel range. This means that it doesn't cover black all that well when thinned sown. Sometimes I will base in a barker brown so the SL has a better starting point but for Abaddon I decided to build up the colour from a black base. After eight layers of SL I had a solid base down on the face. There was still a fair bit of black ghosting thorough but I could really feel the model come to life. I added another five layers of SL and the face was a solid colour with no ghosting of the black. The paint I used was thin enough that 13 layers of paint didn't obscure any of the awesome detail on the model. One thing I should mention at this point is that most paints are not their true colour over black. While this is not a bad thing it is something to consider and use to your advantage. I did just that on Abaddon's face. Even though the face was a solid colour I was still able to highlight it with subsequent layers of SL to all the areas I wanted to bring up. I added another seven layers to areas like the eyebrow, around the mouth, ears, cable insertion points, etc. Even at this point I have my doubts that the colour I was seeing was true SL but the highlights were now present and I could start the build-up in earnest. All the colours of the face from this point on were done with the very thin paint and technique described for blending. I spent 11 hours on the head and face alone taking all the time I needed to bring this statue to life. I didn't record the number of layers for each colour I used but I can assure you that there are hundreds of layers on his face. The colour build-up I did for the highlights is as follows: 80/20 SL/ Cammo Green [CG], 50/50 SL/CG, 20/80 SL/CG, 100% CG. These highlights were done broadly over the raised detail of the entire face. I didn't start localizing the highlights yet because I wanted him to be much lighter in the end. At this point I thought about doing directional shading on his face to indicate a light source. I decided after some thought, that I would not do this in favour of the more 'classic GW' painting style. That being, the highlighting of all raised areas to emphasize the detail. In essence the light source is always in front of each crack and cranny and while this is not very realistic it is very striking. At this point I decided to switch to the mouth [deepest to closest principal] before I had to try to paint it with the finished lips as a frame. With the blending I do a little mistake can translate into hours of re-touching and since we all make mistakes I decided to be safe. The teeth are filed down to points and I knew I wanted them to be pure [vampiric] white. The tongue had to be wild, not over the top, but definitely not natural. So I based the tongue in Hideous Blue [HB] highlighted it with 80/10/10 HB/BB/ Skull White [SW] and then painted the rim and line textures across the tongue with 60/20/20 HB/BB/SW. I only did one highlight to the textures with very thin pure SW. So with the first stage of the highlighting finished I started to really go to work on the texture of his face. The following colours are localized gradually to the extreme highs of each raised area. So the colours I used for the layers are: 90/5/5 CG/ Rotting Flesh [RF] /Bleached Bone [BB], 80/15/5 CG/RF/BB, 70/24/5/1 CG/RF/BB/ Light Jade Green [LJG] [50/50 Jade Green/ Skull White [SW]], 50/39/10/1 CG/RF/BB/LJG, 30/59/10/1, 10/64/15/1 of the above blend. I then did a highlight of 80/19/1 RF/BB/LJG. These highlights constituted the midrange of the highlights of the face and while they were eventually concentrated the highs they were by no means as far as I wanted to go on the face. There are a few reasons for desiring to go lighter, the first being I wanted the face to literally jump out at the observer. I felt that if I could accomplish this, then the fierce savage terror that is a lord of chaos would be obvious. The second reason is that Abaddon is 10,000 'years' old and as such would have a sharp contrast between the shadows and the highlights. The third reason was the desire to translate the Nurgle look into the face. I decided early on to try to carry through some of the whiteness of the Death Guard chapter's power armour. Another subtle tie into to the 'story line' and one only I would notice. Now I was onto the final set of highlights of the face. I was going to take these up all the way to pure white at the extreme most highs and so I sort of planned backwards for this series. I started with 60/30/10 RF/BB/SW and proceeded from there with focus solely on the extreme highs and area around the mouth where the 'lips' are. The build-up was: 40/20/40 RF/BB/SW, 30/15/55, 20/10/70, 10/5/85, 100% SW. These really brought to life the face and I could see that I had captured the look I desired even without the eyes or mouth being done. Now that the highlights were finished I went back and did the metallics of his face. He has 6 studs in his left ear [coincidence that there are 6?…I think not. ], 2 century stud in his head, an eyebrow stud and a tongue stud. These I all did in BM and then highlighted in CM and Mithril Silver [MS]. 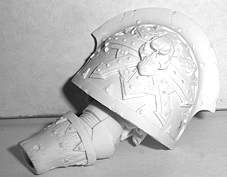 I also took this time when the metallic paints were out to do the deeply recessed locking grooves inside his neck armour. In all honesty I hadn't noticed them as true detail until the face was finished. There were quite a few cables still to do and I decided to do some in purple like the power cables on the chest [see Part III] and some of the thin cables in yellow. I chose yellow to act with the blue to counteract the light green of the face. It is another attempt to translate the 'story line' since I see blue and yellow as Tzeench-like colours and the face as Nurgle-like. Anyone who has read the Realms of Chaos books knows that Tzeench and Nurgle don't get along and since Abaddon is chaos undivided I wanted to put the two together as a sign of his undivided nature. The yellow cables were based in Bubonic Brown [BuB] and then painted with Sunburst Yellow [SY] until there was no ghosting of the BuB. I then highlighted the ends of the cables with 50/50 SY/SW and 10/90 SY/SW. The final part of the face was the eyes. Over the course of the face painting process I agonized over the type of eye I wanted. Was it to be normal with iris striations and a pupil sparkle, or like Marilyn Manson with a discoloured eye, or demonic orbs…? Well, I went with the scariest one that would complement the face. I decided to do solid red eyes, with a radiance emphasized by gemming. So I painted the eyes BuB and then covered this with Blood Red [BR]. From here I proceeded to roughly do what I do with gems and started to highlight the lower portion. I highlighted the entire lower surface using: 50/50 BR/ Blazing Orange [BO], 100% BO and 80/20 BO/SY. Then I focused on the lower inside of the eye and continued to highlight with 50/50 BO/SY, 20/80 BO/SW. With the highlights complete I went to the upper portion of the eye and did some minor shading with a very thin Red Gore. This section will be small compared to most of the parts because it involves the black highlighting and the metallic trim of the armour. It receives a part by itself because of the time involved, effect on the model and the large area it encompasses. 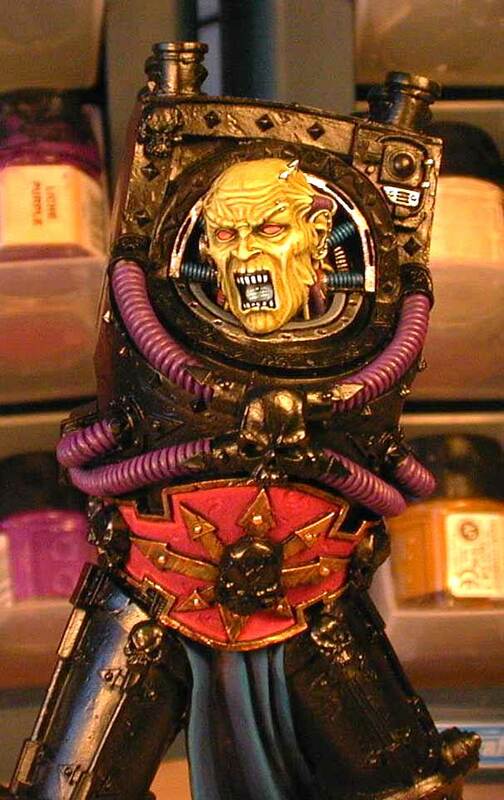 Once I was finished with the head I sprayed the model with GW Matte varnish to protect all the work to date. 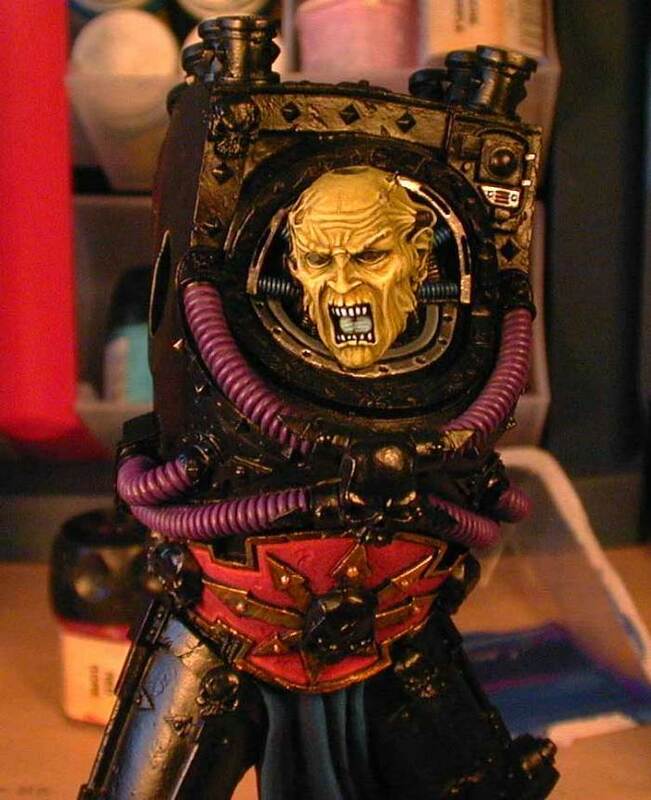 This spray caused me to doubt my black highlights because they were flat and the model was a slight gloss. This effect was hard to see around and I had to trust that the line highlighting I was doing was going to look good when finished. Line highlighting the areas around the trim is not realistic at all. But I wanted to be able to show separation between the black of the armour and the soon to be silver trim. I first applied a broad highlight of 80/20 Chaos Black [CB]/Shadow Grey [SG]. This was not a neat controlled highlight since I hoped it would blend into the black once the model was finished and sprayed. Now, by not neat, I guess I mean tight and sharp because the pictures show I still had smooth lines. In the picture that follows you can see how stark the contrast is, and that is what I mean by the effect of the spray. Once this was finished for the entire body and arms I applied the next highlight of 80/20 SG/CB [dark SG]. This was a true line highlight and the paint had to be at just the right consistency for me to keep the lines so smooth and even. I had to dilute the paint a number of times as I worked due to evaporation over the time it took me to do the lines. It is funny that quite a few people that commented on the statue mentioned the straightness of the lines. Now, from a painting standpoint they are unremarkable and unrealistic and were not intended to catch any ones eye. They were meant to fade into the model as a contrast breaker. So I was quite surprised by these comments and at the same time flattered. Lining so much large area was tedious and I spent many hours at a near oxygen deprived state holding my breath between strokes. The real 'trick' is to have the correct paint consistency, which is just thin enough to not have the positive surface tension seen in thick paint. This means that when the paint is in the pot and you tip it a bit the surface of the paint just flows up the side without a raised 'lip'. So, this paint was much thicker than I usually use but still thinned quite a bit. The other 'trick' is to start your line over the preceding line section. This makes it seem like one smooth line when you are finished. 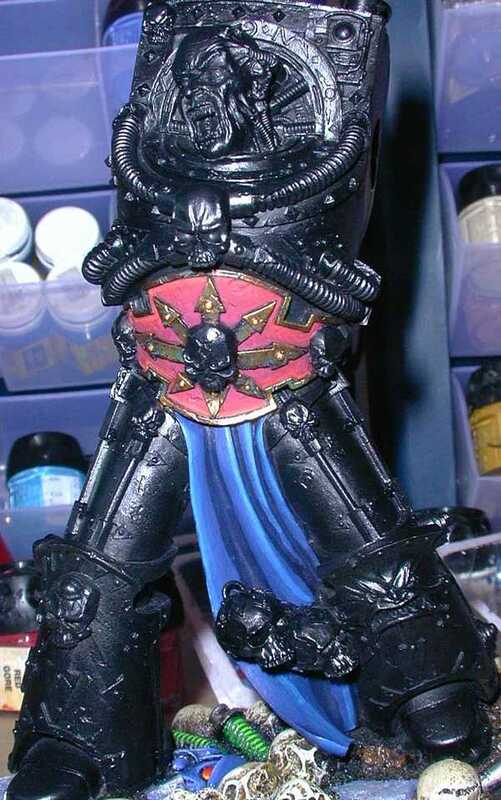 The third highlight on the black was 80/20 dark SG/Codex Grey. This was done only occasionally over the above highlight where I thought I would like a bit more contrast once the silver was on the trim. It was done totally to feel with no regard for lighting effects. At this stage the black was finished. There is battle damage all over the armour and I decided to leave it unhighlighted. Basically, I didn't do it and so the damage disappears on the final model. I didn't want to draw the eye to the armour plates and I felt that the damage would have done just that. With the black highlighting done I sprayed the figure so I could see what the final effect I had achieved would look like. I really liked it once it was sprayed and the entire plate was semi-gloss. At this stage I did however, find the grey line highlights a bit too sharp and hoped that the metallic trim would shift the focus of the eye. Like I said in part IV I found the basis for my trim while doing the airlock seal for the terminator helmet. So just like before I based the areas in 40/60 CB/ Boltgun Metal [BM] then proceeded to highlight the inner and outer rims and the inside raised areas [like rivets] with: 20/80 CB/BM, 100% BM and 80/20 BM/ Chain mail [CM]. Once this base was done for the body section I started to add selective highlights to angles that mirrored where the lighter grey highlight was. The purpose for this was to act as a bridge between the black and the metallic. These highlights were 50/50 BM/CM, 30/70 BM/CM, 10/89/1 BM/CM/Cammo Green. This touch of cammo green allows a subconscious tie in to the face. I then did 100% CM followed by 100% Mithril Silver at most of the rivets and sharp end points of the trim. The reason for this sharp transition in brightness is I wanted these areas to really stand out on the armour and this increased contrast does just that.